Rising demand for quality fertilizers, increased global competition, and stricter environmental health and safety (EHS) regulations are challenging the fertilizer industry to minimize dust and caking quality issues at every step in the fertilizer supply chain. These issues can be partially addressed with proper application of robust fertilizer coatings, such as anti-dust and/or anti-caking coatings at fertilizer production points. But as fertilizer ages and is abraded during subsequent handling steps, the challenge of maintaining the physical integrity of the fertilizer increases, and there is often a need for additional downstream treatments. There is also a need for blending facilities to better adhere and homogeneously mix micronutrients with macronutrient fertilizers. 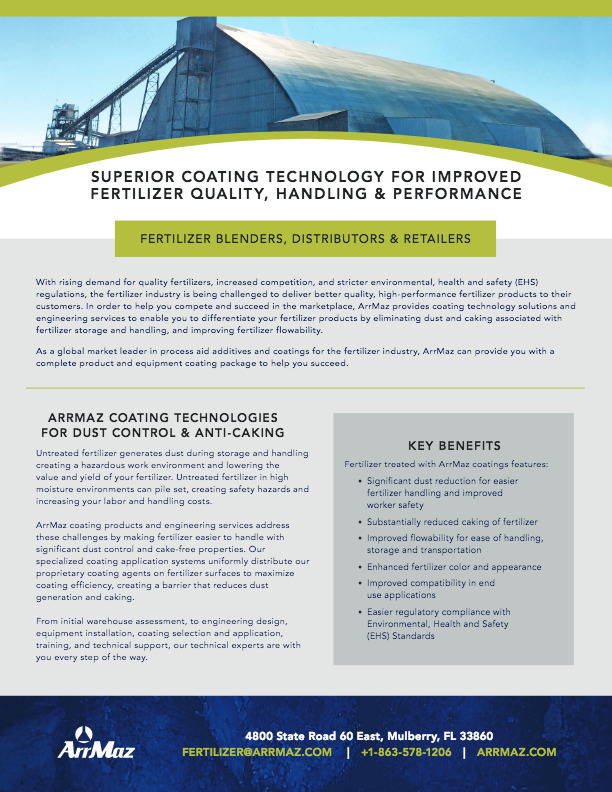 Unlike fertilizer production points, downstream facilities such as fertilizer storage, warehouses, terminals and transload sites seldom have coating treatment application systems integrated into their facility designs. This means that, in addition to the actual coating itself, these facilities need system design, engineering, construction and installation of a coating system. ArrMaz provides safe, operator-friendly and effective coatings and coating application systems designed to work within the physical and economic constraints of non-production fertilizer storage and transportation facilities across the globe. We will work closely with you to recommend the best coating package and design an optimal coating application system for your specific facility.